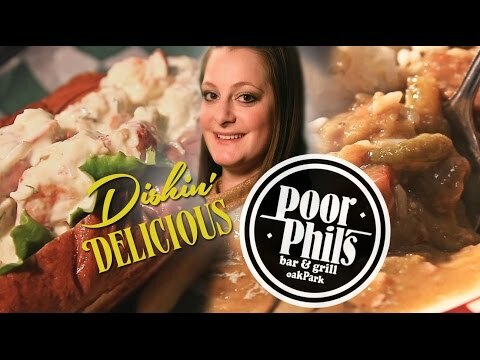 In the second episode of "Dishin' Delicious," we visit Poor Phil's Bar & Grill to talk about two of their most popular menu items: the Lobster Roll and the N'awlins Gumbo. Check out the video below to find out about these delicious dishes! Where should we go next? Email vopnews@oak-park.us with your local recommendations. Poor Phil's Bar and Grill is located at 139 S Marion St., Oak Park, IL 60302. It's the pub with the biggest beer menu in Oak Park, from boutique brews by the bottle and on draft, snakebites galore, or black and tans. That's all thanks to Dennis Murphy, known by many as the dean of Oak Park restaurateurs. Murphy, who opened his first place here in 1975, calls himself instead the father of a flock of kids. And rather than talking about how diners at Poor Phil's differ, he turns conversation to what they share: Every table has a centerpiece anchored with an American flag. Contact Poor Phil's at 708-848-0871. As a life-long foodie and resident Oak Parker, I'm excited to tell you about the many interesting culinary experiences that my hometown has to offer in the new Village of Oak Park series "Dishin' Delicious." You may have seen me around town writing about my favorite food -- BACON! -- for the Bacon Quest section of Fall Food & Fun for Wednesday Journal that publiahed in print on September 23rd, but I'm taking my food reviews to the big screen with Dishin' Delicious airing on local television. In the inaugural episode of "Dishin' Delicious," we went to Marion Street Market for their crab-crusted walleye with green garlic remoulade accompanied by salt and vinegar potato salad. Watch the video here. 2 of my Oak Park favorite people! Great video Alicia and Mary, who knew ? You are ready for Check Please! Really fun video Alicia! Nice! Makes me want to order a lobster roll next time I go there!